There is nothing better then smelling and devouring a loaf of fresh bread! I was always convinced till now that you has to be born with the dough gene. My husband is amazing at whipping up bread. The incredible thing about him is he does it with out a recipe. I do not know how he is able to do it, he just whips it up. Now I on other hand follow a bread recipe to a T and it sometimes comes out OK others it does not even come close. I also hate going to the store and paying over $2.50 or more for OK bread that cost probably 50 cents. Till now -I bought this cookbook for my husband for Christmas so I could have some more delicious homemade bread. I have taken this book over... it is the most amazingly easy and yummy way to make bread!!! No more needing and more needing and letting it rise and rise and rise. This book deletes most of those steps so you seriously some days only spend 5 minutes on the bread. 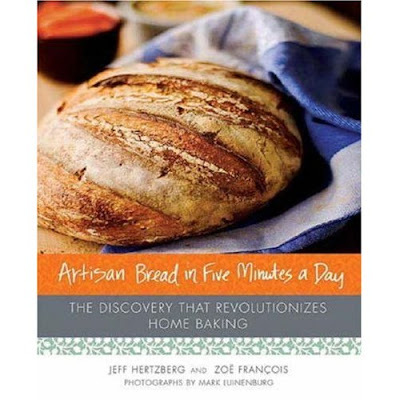 Artisan Bread in Five Minutes a Day by Jeff Hertzberg and Zoe Francois. I recommend any one who likes fresh bread to get this cookbook! Chris Briel here, I absolutely agree with you about there being nothing better than devouring a loaf of fresh bread. If I can make bread in 5 minutes that looks like the cover of that book, I'm in. Thanks for the helpful info and Happy New Year! I'm going to check out the book. Still haven't used my fancy cast iron pot from Simone, but making more bread is one of my New Year's resolutions!